Makanmaniacs.com is getting its first public in newspaper! 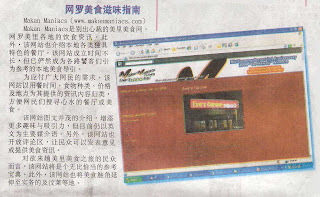 It is published in Sin Chiew Daily today (31.05.2009) alongside with MCnet, Life after Forty, MiriCity and MiriResortCity. Looking forward if there are any articles about us soon. so must have more food ya!! !